Garage floors have been a growing home improvement project in many houses today. They add comfort, warmth, safety and beauty to a normally cold, hard place. The most popular types of floors are rolled garage floors (sometimes call rubber garage floors) and garage floor tile. When it comes to garage floor tiles there are many types to chose from including hard and soft. The hard garage floor tiles are floating tiles and they are either perforated to allow water and spills to drain below them or solid to somewhat keep spills above the tile. They usually have some kind of an attaching system that allows them to snap together and stay in place. There are various types of plastic garage floor tiles and the quality of these tiles will vary greatly. Always be sure to know the type of flooring you are buying because when it comes to plastic garage tiles, price is not nearly as important as quality. Cheap garage floor tiles can warp and break under heavy loads. Soft garage floor tiles are a rubber like material. Actually made from PVC, soft tiles usually come in a peel and stick variety. The popular rubber garage floor tiles manufactured by Better Life Technology are manufactured at an impressive 95 mil base thickness and include a peel and stick backing that makes installation a breeze. BLT garage floor tiles are available in 3 colors including Midnight Black, Absolute White and Slate Grey. They are available in levant and diamond tread patterns in both a 12″ and 24″ tile. Rolled garage floors are the lowest cost and easiest type of garage floor to install. These floors are simply rolled out and the seems are either overlapped or butted together. They do not need to be glued down and the seems do not need to be taped. If you are interested in securing a rolled rubber garage floor, there are seeming tapes and floor adhesives available but they are certainly not required. Rolled garage floors are available in widths from 7.5 to 10 feet wide and various lengths. Custom lengths are also available if you are unable to locate the right size roll for your garage. 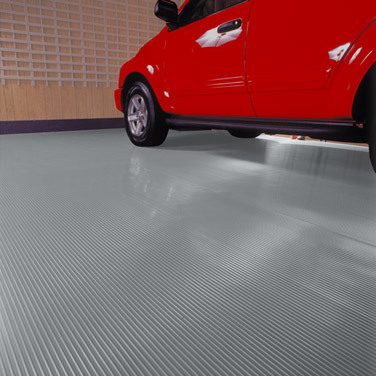 Rolled garage floors are available in 4 patterns including diamond tread, levant, coin and ribbed. Various thicknesses are also available ranging from 55 mil to 85 mil and in 6 different colors. Ultimately there are many reasons to choose one type of floor over another. Cost, appearance, durability and ease of installation are the most common. The look of a garage tile floor will be much different than that of a rolled garage floor. Most garage floors are easy enough for the average homeowner to install themselves so if you are up to the challenge, you should be able to install any of these floors. As for durability it is best to purchase the highest quality floor you can afford. The cost of a heavy grade rolled floor may be about the same as a cheap tile floor. But for the same amount of money, the rolled floor will last much longer and look much better. This entry was posted in Updates and General Garage Flooring News and tagged cheap garage floor tiles, cheap garage floors, Garage Floor, garage floor coverings, garage floor mat, garage floor tiles, garage floors, plastic garage floor tiles, rolled garage flooring, rolled garage floors, rubber garage floors on September 5, 2008 by GFI. Garage Storage and Cabinet SALE!